Got Kids? 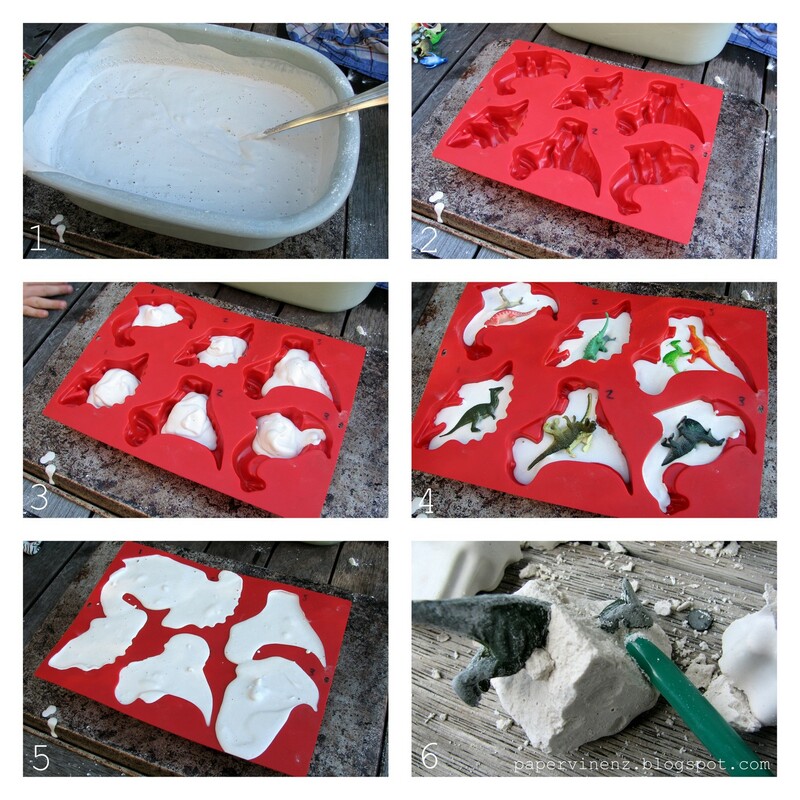 Make your own Dinosaur Fossils! Give your little one a few tools and let them get excavating! You can of course use anything as a mold (yogurt pots, ice cream containers) and below you can see a series of pictures showing how you can make a really big one in your sandpit! Here is how I made a BIG fossil in the sandpit which took the kids days to excavate! Let the kids loose with a hammer and some paleontologist protective eye goggles -cheap safety glasses! These little molds are so neat with their dino shapes – I think they are for muffins. I made these crayons below using a tutorial I showed here. Let me know if you give this a try! Goes without saying this is something you need to make and get the kids to play with OUTSIDE!! Such a great idea!!! This would be great to use in a classroom as well. Thanks for sharing Lowri! These are such a great craft to do with my son 🙂 Cheers! I have a Dino Lover at my house and he would LOVE this! Thanks for sharing! 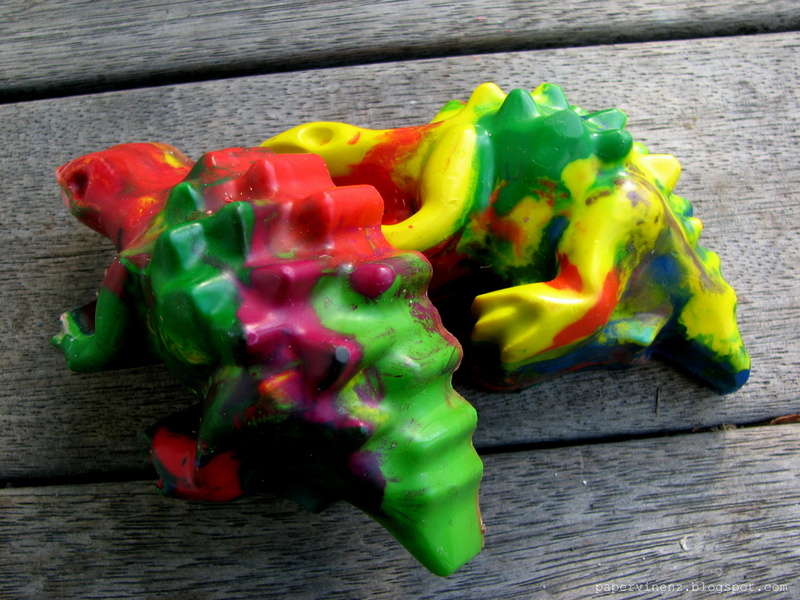 Do you remember where you got your dino molds?? I bought them at K-Mart – but that was here in New Zealand…they are muffin molds! This is a fabulous idea! We are having dino week this week so I better head to the hardware store – this is a perfect ending for our week. Thanks for sharing! Wonderful! I am featuring this submission to our weekly Playdate on our new Playdate for this week… come and snag your 'featured' button and add some more links if you like! LOVE LOVE LOVE LOVE this! we are going to try it next week. thanks for posting. incredible idea. Hey Lowri, I was wondering if you can tell me what kinds of tools you gave your children to do the excavating. Will plastic play tools work, or do they need to use "daddy's" tools? Hi Beth – I bought the kids small craft hammers from the dollar store. I have also given them small but solid (non-sharp) clay carving tools and cheap paintbrushes on a huge tray and let them do it on the kitchen table when it has been raining. We have a farmhouse kitchen though – do not suggest you do this if you have a fancy kitchen! Using the small tools makes the small fossils last ages. For the big one you might like to use a big hammer – depending on how old they are! Lowri, we SO do not have a fancy kitchen. I would let them do that in my kitchen…although we are planning to do the first batch later this week to play with on Friday for my 6 year old's birthday. My boys would love this. It would be perfect for a dinosaur birthday party! I would love it if you wanted to share this idea, and any others, at my "It's a Celebration" link party. I think everyone will love it, I know I'm not the only one always on the look out for good boy party ideas! This is neat. Thanks for sharing it with me. That is awesome! I would love it if you would link up to my Tuesday Confessional link party going on now: http://www.craftyconfessions.com/2011/07/tuesday-confessional-link-up-2.html. I hope to see you soon! Love this! I shared this on our blog today. Can't wait to try this out. You're such a great mom! I shared this on my blog! Thanks for inspiring me! Hello! This is such a great idea. I linked your blog to our Natural History Museum page on Facebook. We have lots of kids visit us and this would be a great project to do at home! So cute! What kind of "tools" did you have them use to excavate the fossils? Can you use something else other than plaster of Paris? Can I use the plastic hello molds? Or would it crack easily? I've tried your brilliant idea today. As I didn't have anything practical to fill the plaster in, I used aluminium foil. After a while the plaster got really warm. Is that normal? Or did that happen because I used the aluminium foil? That's normal. The chemical reaction of plaster and water is exothermic (produces heat).